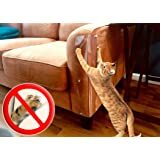 Two 28 x 11cm inch Clear Cat Scratch Guards with Pins - The Original CAT Scratch Guard Furniture Protector - Love Your Furniture and Your Cat! YOUR CAT WILL NOT SCRATCH THESE...EVER. Since 2008 no cat has scratched at these guards. The high quality vinyl is thick enough to deter scratching and flexible enough to bend around the contours of your furniture. CATS WILL USUALLY SCRATCH AT THE STURDIEST PARTS OF YOUR FURNITURE. The sturdiest part of your furniture is at the corners where the frame is and these guards cover that area. The vinyl is attached to your upholstered furniture with the provided pins. YouTube "Cat Scratch Guard" for an installation video. OUR PINS ARE SHORTER THAN OTHER PINS WHICH ENSURES AN EASY INSTALLATION. Our higher quality pins and vinyl make all the difference and by purchasing high volumes of these materials we are able to keep our prices low. Four extra pins are included in every package. Not recommended for leather because of the pins. CLICK "FOCAL POINT SOLUTIONS INC." UNDER "IN STOCK" ON THIS PAGE FOR MORE REAL CUSTOMER REVIEWS. Unlike sellers who pay "Buyers" or give away products to receive multiple 5 star reviews there are NO fake reviews for our products anywhere on the internet. 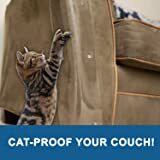 Cat Scratch Guard Furniture Protector - Two LARGE 28 x 23cm With Pins - Love Your Furniture AND Your Cat! LAMINET The Original Deluxe Cat Scratch Shields - Protect Your Furniture with Our Deluxe Heavy Duty Furniture Scratch Shields - Set of 2 Heavy Duty Flexible Plastic Shields - 11" x 5.5"
LAMINET The Original Deluxe Cat Scratch Shields - Protect Your Furniture with Our Deluxe Heavy Duty Furniture Scratch Shields - Set of 2 Heavy Duty Flexible Plastic Shields - 7" x 5.5"
Bought these awhile back. They work just fine. My cats didn't scratch the corners. I found a cheaper solution though. Hobby Lobby carries the same clear soft vinyl and curly cue furniture tacks. I did all my furniture at a cheaper cost of doing one couch with this. Plus you can cut it to any size you need. Save your money, go to Hobby Lobby or craft store. It did work for me and my cats. The furniture tacks are small and easy to use, done properly it only makes a tiny hole and doesn't leave a spot when removed or readjusted, dont try to force it into wood. 5.0 out of 5 starsLeather! I couldn't find any reviews about people trying this with the pins on Leather (except the one reviewer who creatively used Electrical tape). The manufacturers clearly state that they do not recommend these be used on leather but I had no choice. Either let them put millions of holes in the new chairs or I put 4 pin sized holes and save the thing. So clearly, I tried it (I put a picture up with the customer pictures). I think it looks great. I was careful to turn the corkscrew like pins so that they stayed in one hole and, I'm no designer, but they don't offend me! Not only that, the first attempt to use it as a scratching post was deterred! A complete success. 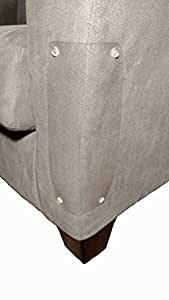 And by the way, maybe I'm richer than I think I am but $12 to protect my leather chair seems like a bargain and worth it to pay for someone's ingenuity (referencing the "Too expensive" comments). Thank you for making these, what an awesome solution for a costly problem! Installing these Cat Scratch Guards was certainly not what Crate and Barrel had in mind, but my cat clearly does not respect aesthetics. She had already managed to mangle all four corners and the back of my expensive microfiber chair. Sticky tape eventually began to do little more than break down AND attract lots of hair...so, I had to try something different. See photos of 4 protector placements (2 along back, joined in the middle and wrapped around each edge, and 1 placed on each front leg corner). These were easy to install, and the cat no longer scratches anywhere on the chair. As for how they look...you be the judge. Btw, anyone want a cat? 5.0 out of 5 starsSo simple yet so perfect! Excellent purchase! 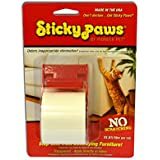 This worked perfectly on my couch and keeps my cats off! I am honestly amazed and how well this works for something so simple. Great deal. Great Product! For any of those with totally ripped up couches (like mine), I also recommend making a large iron on fabric patch or sewing fabric right on the couch. Your couch can be beautiful again! These are attractive and work, but overpriced. I bought one pair, but even though I have a small living room and not much furniture, could not see paying that much. I went to Joann's and was able to buy more than enough of the plastic and the pins to attach them for less than the cost of one set. If they had been a bit more reasonably priced, I would have bought more, but the price drove me to make my own. That being said, they seem to work.